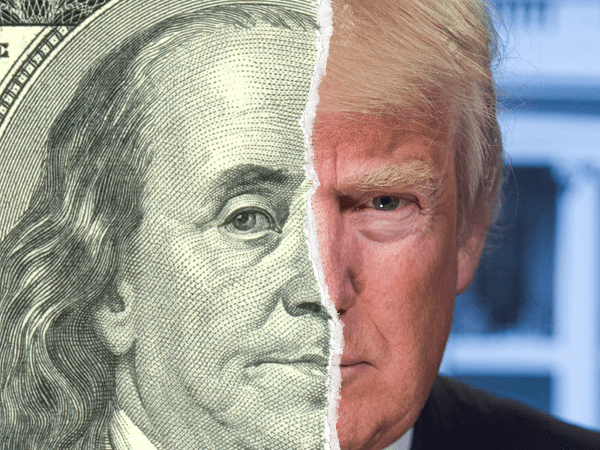 Donald Trump surprised everyone last week with new remarks about the dollar – remarks that could have serious consequences for your retirement account. Over the last 8 long years of heavy-handed Federal Reserve policy, the U.S. dollar has fallen dramatically. But Trump’s upset victory, plus two rate hikes since Election Day, had started giving the dollar new strength. However, with the dollar gaining steam for the first time in years, Trump just said eight little words that are threatening to send it back to rock-bottom. Here’s how it could put retirement accounts in the red, and what you can do to keep your savings protected. I do like a low-interest rate policy, I must be honest with you. I think our dollar is getting too strong, and partially that’s my fault because people have confidence in me. But that’s hurting—that will hurt ultimately. Before entering the White House, Trump claimed he would do anything in his power to strengthen the dollar – by battling the Fed, pushing for higher rates, and replacing Fed Chair Janet Yellen. But looks like he’s changed his tune…and the dollar is crashing as a result. What Else Will Trump Do to Push Down the Dollar? It’s completely unorthodox for a president to comment publicly on the dollar’s valuation. But this is the second time Trump has broken that convention. He made similar comments about the dollar being too strong back in January, and now he’s doing it again. In our memory, no president has ever done this before. It seems as though Trump has no qualms with using his public influence to manipulate the dollar. So who’s to say he won’t take other actions to push it down? If he does, average Americans are the ones who will hurt the most. But, as we explained when Trump made history with his dollar comments in January, there is one thing you can do protect your financial security, and potentially even make money from his “weak dollar” agenda. Even when the dollar was strengthening in recent months, it wasn’t enough to outpace inflation. That means, if your savings are in dollars, they have slowly been losing spending power for years. But with Trump’s recent crusade against the dollar, now your savings are at risk of losing their spending power FAST. With each jab Trump takes at the dollar, your savings and retirement accounts get thrown on the chopping block. Thankfully, there’s an easy way to keep your nest egg safe from the dangerous effects of inflation, Trump’s political maneuvering, and the falling value of the dollar: gold. For thousands of years, gold has protected and preserved people’s wealth as fiat paper currencies have imploded. That’s because, as paper currencies LOSE value, gold generally GAINS value. 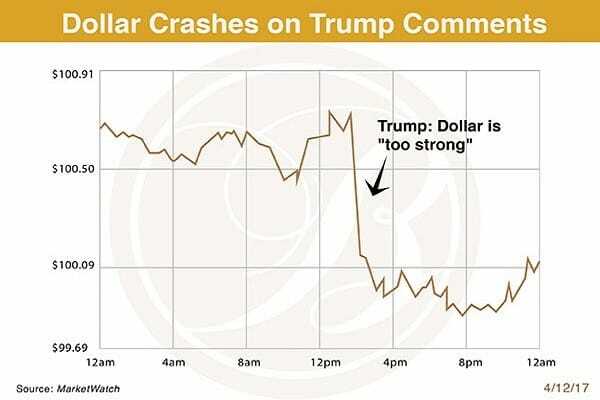 It happened the last time Trump bashed the dollar. Now it’s happening again. One of the simplest methods to build financial security through gold is to convert a 401(k) or IRA into a “Self-Directed” IRA — an account that gives you complete freedom and power over your money, and allows you to invest in real, physical precious metals. Trump’s position is clear: He thinks the dollar is too strong, and he doesn’t appear to be afraid to do what it takes to keep it subdued. Whatever happens to Americans and their savings accounts as a result is just collateral damage. So don’t wait. Act soon before this opportunity, and your savings, falls away.